At Potter Park Zoo, the zoo animals get routine health check-ups by Dr. Ronan Eustace to ensure they are as healthy as possible. A thorough dental evaluation at each of these examinations is a vital part of providing the best veterinary care possible to the animals. 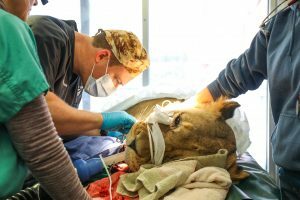 Dr. Ronan, Potter Park Zoo’s Director of Animal Health, sutures Ulana that African lion’s gums after removal of a damaged premolar. Dental disease can cause an animal pain and discomfort but may also predispose them to developing systemic health problems like heart disease. Everyday, our zookeepers monitor the animals for any signs of illness, including evidence of tooth problems. Despite the diligent efforts of our staff, zoo animals often hide painful dental disease and regular examinations can help prevent, detect and treat dental conditions before they cause serious illness. “Dental disease is one of the most common problems that I identify during routine examinations and correcting it can have a profound impact on an animal’s well-being. The range of dental disease at the zoo is very diverse, ranging from routine cleaning and polishing on a mandrill to advanced treatments like performing a root canal on a lion,” said Dr. Ronan. 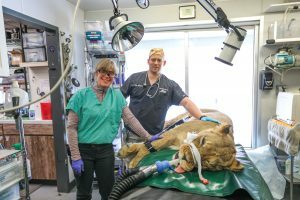 The veterinary staff at Potter Park Zoo is equipped to handle most dental issues at the zoo, but for more complicated cases the zoo benefits from the expertise of Dr. Colleen Turner, a veterinary dentist who works with Michigan State Veterinary School. She generously volunteers her expertise at the zoo. 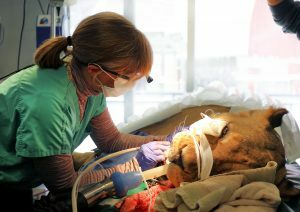 Last week, she came out to help with a root canal on Ulana, one of the female African lions. Dr. Turner’s expertise enables the zoo to provide the best care possible to our animals, no matter how big or small they are. Dr. Turner, a veterinary dentist who works with Michigan State Veterinary School, performs a root canal on Ulana the African lion. This year the Potter Park Zoo Veterinary Department hopes to raise funds to purchase a digital dental X-ray system that would allow the zoo to perform dental digital radiographs. This equipment would increase the zoos ability to detect dental disorders earlier and allow earlier interventions, which would greatly benefit our animals. This equipment costs several thousand dollars and every penny helps! Please visit https://potterparkzoo.org/donate/ to make an easy donation online. “By keeping our animals’ teeth in excellent condition, we can help them have long healthy lives “says Dr. Ronan. Animals at zoos often live longer than those in the wild, and having complete dental care is a key factor to helping them live a long happy comfortable life at Potter Park Zoo. Dr. Ronan and Dr. Turner after a successful root canal procedure on an Ulana Lion.